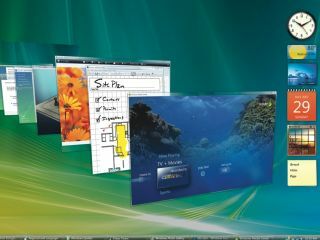 Microsoft has finally set a date for Windows Vista's first service pack - although the company is dropping a beta version first - something that will delight and frustrate in equal measure. Performance tweaks that cut the time it takes to copy files and shut down Windows Vista equipped machines. Improved transfer performance and decreased processor use via support for SD Advanced Direct Memory Access (DMA). Support for the ExFAT file format used in flash memory and consumer electronics devices. Improvements in BitLocker Encryption Drive that will enable you to encrypt locally created data volumes. The ability to boot the Extensible Firmware Interface (EFI) on an x64 machine. Improvements for firewalled MeetingSpace and Remote Assistance connections. Microsoft is keeping tight-lipped about the update. "Unfortunately we do not have any information to share at this time," said Microsoft spokesperson Liam Jacklin. We'd asked whether there was any more news to share given the SP1 rumours now flying around the net. We have to say we're not surprised by the corporation's stance. It might still happen. The November date has been banded about as it is also the release date for the server version of Windows Vista , imaginatively entitled Windows Server 2008.